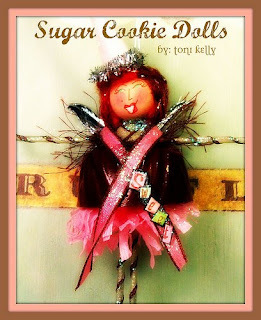 My Blog: Sugar Cookie Dolls - All are Soooo Sweet!! 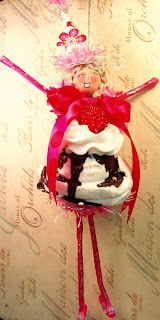 Sugar Cookie Dolls - All are Soooo Sweet!! A few weeks ago, I stopped by the Etsy Shoppe of Sugar Cookie Dolls and was blown away by the talent and creativity of owner and designer, Toni Kelly. She has put together a collection of Sweet Little Pixies, Goddesses, Dolls that celebrate food and life; along with the love and adventure of that life. I can't say enough about these marvelous designs created by such a talented woman! 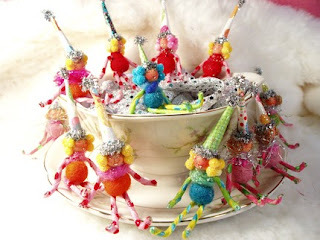 Here's a photo (above) of her collection of Party Pixie Dolls. I, myself, purchased one of these lovely Party Pixie Dolls and I have to tell you she is the cutest Pixie ever! She's hanging around the house, jumping from one shelf to another, taking in the view. I never know from day to day where she'll end up!! Just look at Ice Cream Sundae Party Pixie Doll (above), the detail on this gal is so yummy, you may find yourself running to the refrigerator every time you look at her!! 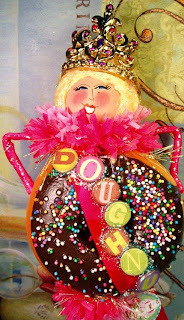 This girlie has a fake chocolate doughnut with sprinkles body and is wearing a hot pink, satin ribbon sash that says "Doughnut Diva". A fancy gold tiara sits atop her yellow hair and she's wearing hot pink high heeled shoes. 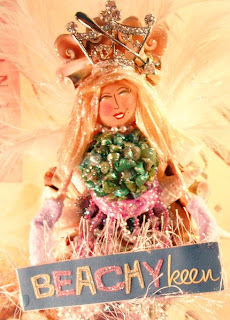 Naturally, living on the coast makes me just so affectionate for the Beachy Keen - Beach Goddess Doll. She is just amazing. Check out those tiny shells that she probably collected on the shore and that tiara on her head (oh, what wonderful detail!). Nancy, oh my goodness! Thank you so much for all of your sweetness...it feels so great to hear that someone else out there loves them as much as I do. What Comes First - The Hen or the Egg Cosy?